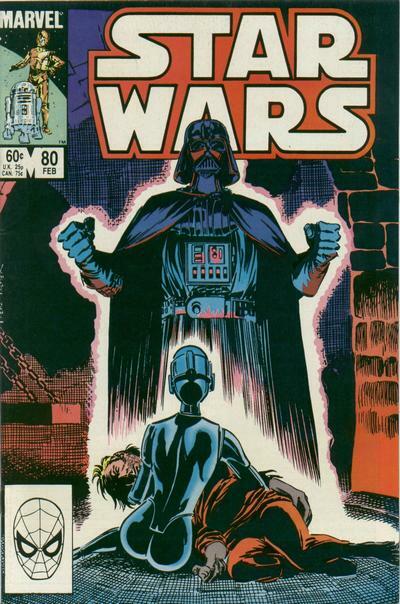 The "Search for Tay Vanis" comes to close in this issue on on a bittersweet note, with Vader having captured Vanis long before the Star Warriors even set out to find him, and left him in a state worse than death, prompting his loyal droid Ellie to end both their lives after giving the Bothan tapes to the Rebels.This issue also marks the conclusion of the series' post-Empire, pre-Jedi era, as the events of Return of the Jedi fit between next issue and this one. 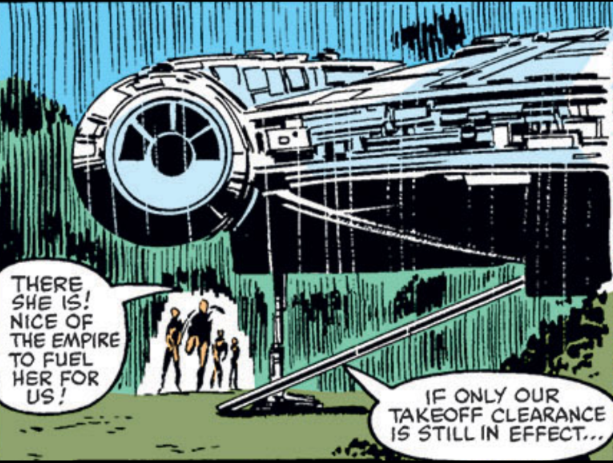 As a result, this is the last issue to feature elements of the Empire as we know it (since any appearances hereafter will feature the Emperor-less, Vader-less, post-Death Star II-destruction Empire). It’s said that Tay Vanis was carrying tapes he received from Bothan spies containing plans for a new kind of Imperial super weapon, thereby linking Vanis to the Bothan spies who acquired the plans to the second Death Star referenced in Return of the Jedi. 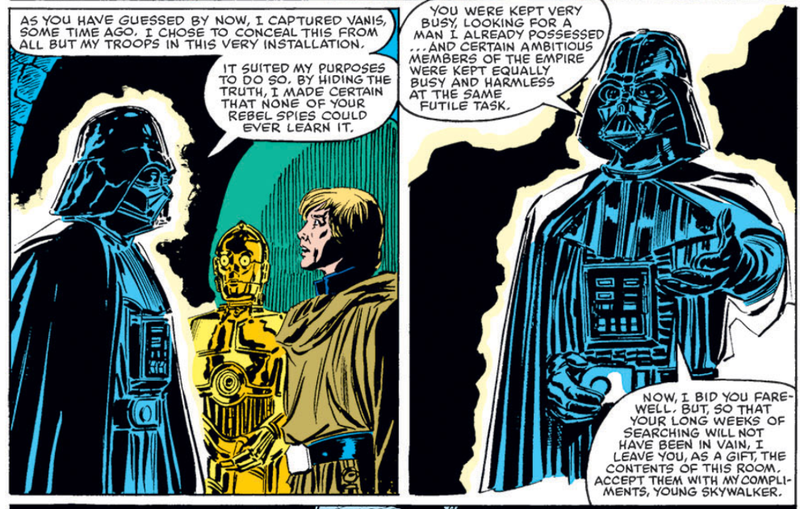 Luke and Vader come face to face (sort of - it’s a prerecorded hologram) as Vader explains that he captured Vanis relatively quickly, but concealed that fact even from his fellow Imperials, to keep everyone from the Rebels to annoying Imperial officers busy chasing a ghost. 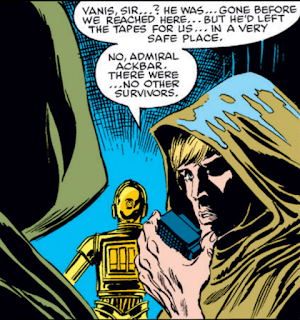 Ellie passes along the Bothan tapes acquired by Vanis to Threepio, thus revealing how the Rebels acquired them ahead of Jedi. 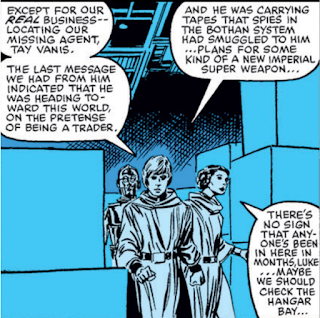 Luke is shown to be communicating with Admiral Ackbar, making this the first chronological mention of the character (since this story takes place before the movie). Luke & Leia make things worse for themselves by drawing their (in Luke’s case, very noticeable) weapons before the Stormtroopers show up in response to an alarm, as the troopers arrive without knowing who tripped it. 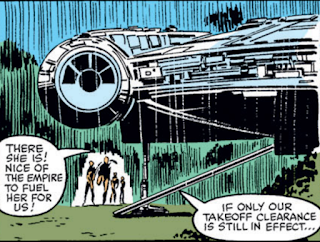 Similarly, the Rebels once again used the Falcon while infiltrating an Imperial facility, which seems...ill-advised. 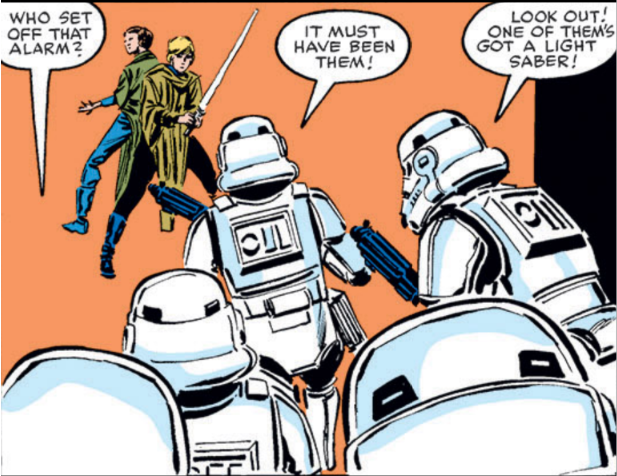 It’s not quite “Wolverine vs Silver Samurai” in Uncanny X-Men #173, but there’s a nice sequence of Luke lightsabering Stormtroopers, something we don't see nearly often enough. 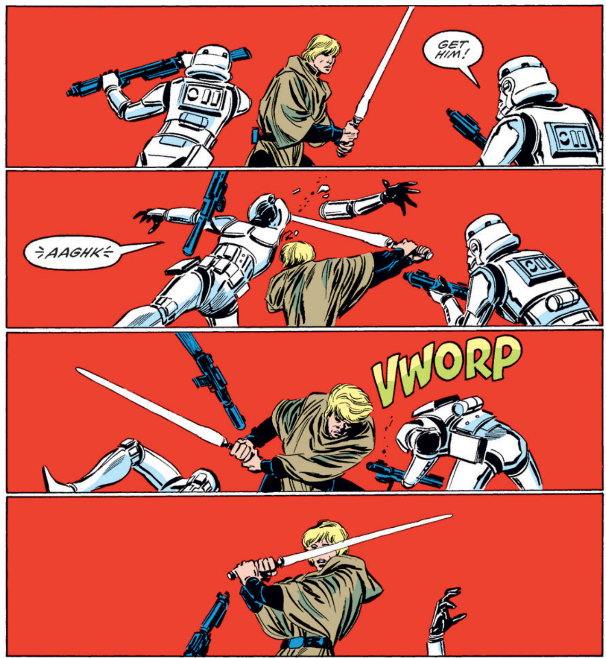 “The Search for Tay Vanis” and the series’ pre-Return of the Jedi era comes to a bittersweet conclusion, as Vanis is finally discovered in a state worse than death, even as he succeeds, after a fact, in delivering the Death Stars plans which kick off the plot of Jedi to the Rebellion. This is also a strong issue for Threepio, as he clearly shows an affinity for Vanis’ droid without the script explicitly spelling out that attraction (the concluding panel of rainwater streaming down Threepio’s face mimicking tears is maybe a touch too on the nose, but it works). 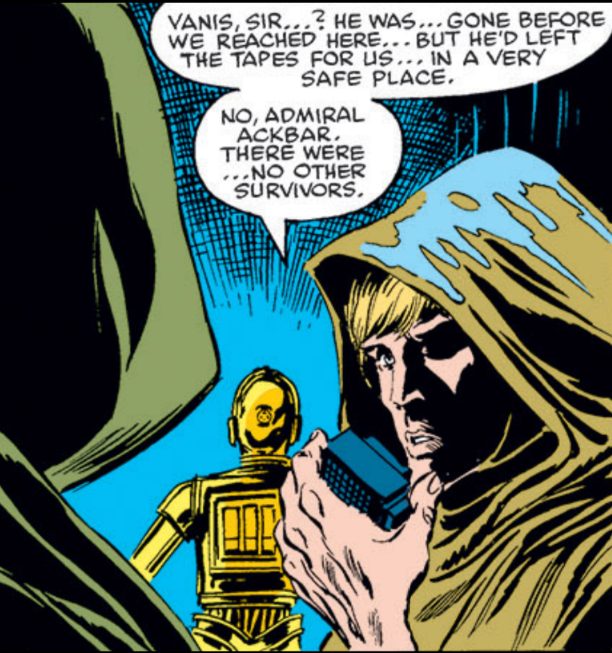 Threepio is rarely allowed to be a subtle character, so it works all the better when he gets the chance. 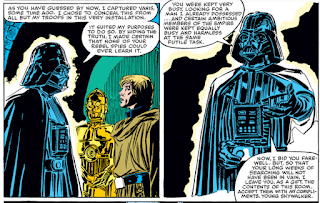 Meanwhile, Duffy manages to thread the needle of needing Vanis to succeed in getting the plans to the Rebels, but also not making the conclusion a 100% happy ending, while also giving Vader (in hologram form), one last real-time villainous twist-of-the-knife before the series catches up to the narrative chronology and the character’s death. 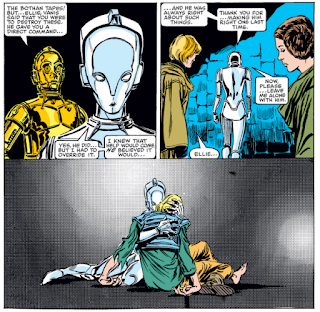 All in all, between the bittersweet tone, the handling of Threepio, and the narrative relevance of showing how the Rebels received the Death Star plans, the pre-Jedi era of the book ends on a high note. A look at the first wave of Return of the Jedi action figures! Agreed. 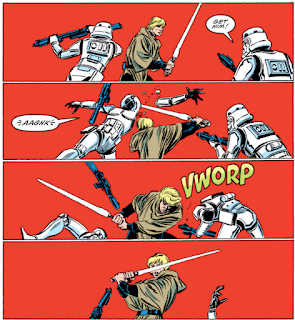 That was a good issue. Stands on its own fairly well too.